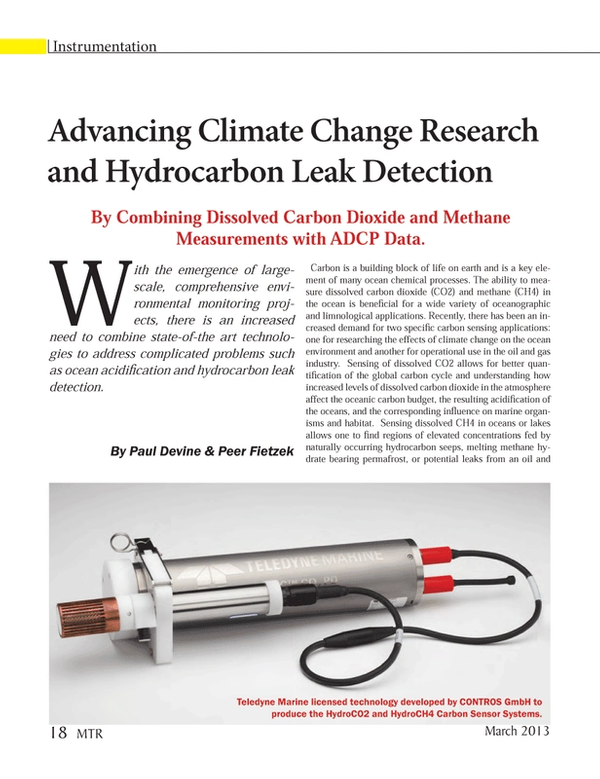 By Combining Dissolved Carbon Dioxide and Methane Measurements with ADCP Data. With the emergence of large-scale, comprehensive environmental monitoring projects, there is an increased need to combine state-of-the art technologies to address complicated problems such as ocean acidification and hydrocarbon leak detection. Carbon is a building block of life on earth and is a key element of many ocean chemical processes. The ability to measure dissolved carbon dioxide (CO2) and methane (CH4) in the ocean is beneficial for a wide variety of oceanographic and limnological applications. Recently, there has been an increased demand for two specific carbon sensing applications: one for researching the effects of climate change on the ocean environment and another for operational use in the oil and gas industry. Sensing of dissolved CO2 allows for better quantification of the global carbon cycle and understanding how increased levels of dissolved carbon dioxide in the atmosphere affect the oceanic carbon budget, the resulting acidification of the oceans, and the corresponding influence on marine organisms and habitat. Sensing dissolved CH4 in oceans or lakes allows one to find regions of elevated concentrations fed by naturally occurring hydrocarbon seeps, melting methane hydrate bearing permafrost, or potential leaks from an oil and gas well, production facility, or pipeline. Teledyne Marine has recently licensed technology developed by CONTROS GmbH to produce the HydroCO2 and HydroCH4 instruments and allow its customers to better address their bio-geochemical as well as oil and gas-related applications. Combining carbon dioxide and/or methane concentration data with the physical oceanographic parameters measured with Teledyne RD Instruments’ Acoustic Doppler Current Profilers (ADCPs) and Conductivity Temperature and Depth (CTD) sensors will allow improved understanding of biogeochemical processes as a function of ocean temperature, salinity, mixing, and advective transport. Integration of the ADCP current profiles and volumetric transport information with the dissolved gas readings from the HydroCO2 and HydroCH4 systems will also improve the utility of hydrocarbon leak detection programs by allowing users to backtrack the “up current” to identify the source of the seep or leak. Facilitating and expanding data collection will be accomplished by integrating the HydroCO2 and HydroCH4 in-situ sensor technologies with other Teledyne Instruments, Inc. product offerings. Examples are the Teledyne Benthos, Teledyne Webb Research, and Teledyne Gavia tethered, towed, and autonomous vehicles. The HydroCH4 sensor may be combined with the Teledyne TSS Pipe Detection system via the Mobile Early Leak Detection System (MELDS) for detecting the presence of hydrocarbons in water. The HydroCO2 and HydroCH4 products utilize a flat hydrophobic membrane that forms a semi permeable phase boundary between full ocean depth pressures and the interior of the instrument. Dissolved gasses in the water pass into an equilibrated internal headspace in the form of a gas stream. Concentration of CO2 or CH4 in the gas stream is quantified using an industry standard non-dispersive infrared detector (NDIR-detector) and the principle of absorption spectrometry (1). To overcome the temperature dependency of the NDIR sensors, the detector is temperature stabilized and the gas is lead through a heater before entering the NDIR unit both during initial instrument calibration as well as during operation in the field. To compensate for the long term drift of the sensor, a “zero point” reference is routinely taken by the NDIR-detector within the instrument after the air within the gas stream has been chemically freed from CO2 or CH4. This zero reference data can be used to track the temporal signal drift of the NDIR-detector and allows for the derivation of the sensor’s actual response time (2). The HydroCO2 and HydroCH4 physical packaging allows for a wider range of deployment possibilities than previously available with existing dissolved CO2 and CH4 measurement systems. When configured as a flow through system inside of a vessel or within a laboratory, these instruments have a significantly reduced maintenance effort and smaller size than prevailing underway systems that use large equilibration chambers and bottles of reference gasses. Use of the HydroCO2 and HydroCH4 systems enable deployment from smaller vessels, adding a valuable measurement parameter while reducing the energy and space requirements (e.g., less room occupied in a vessel’s wet lab). When configured as a self-contained submersible system, the systems will operate from water surface to 6000m of depth. The 9 cm diameter pressure housing on the system allows for easy deployment on buoys, moorings, AUV’s, gliders and Argo floats (2 and 3). Example of a bottom lander deployment combining an ADCP and the HydroCH4 sensor is shown here. Teledyne RD Instruments is confident that these carbon sensors will aid in both scientific research and environmental monitoring. Through a newly established product grant program, Teledyne RD Instruments will offer the loan of up to 3 instruments – one each of either a HydroCO2, a HydroCH4 senor, a WH/OS ADCP, or Citadel CTD system – for new and interesting applications utilizing these combined technologies. Users are encouraged to submit detailed proposals on how they would utilize these products to improve their scientific research or environmental monitoring. www.rdinstruments.com. Proposals are due on or before April 15, 2013. (1) Fietzek, P. & Körtzinger, A. (2010) Optimization of a membrane based NDIR-Sensor for Dissolved Carbon Dioxide. In Proceedings of “OceanObs’09: Sustained Ocean Observations and Information for Society” Conference (Annex), Venice, Italy, 21-25 September 2009, Hall, J., Harrison D.E. & Stammer, D., Eds., ESA Publication WPP-306. (2) Fiedler, B., Fietzek, P., Vieira, N., Silva, P., Bittig, H.C. and Körtzinger, A. (2013): In situ CO2 and O2 measurements on a profiling float, Journal of Atmospheric and Oceanic Technology, 30 . pp. 112-126. (3) Fietzek, P., Kramer, S. & Esser, D. (2011) Deployments of the HydroC (CO2/CH4) on stationary and mobile platforms – Merging trends in the field of platform and sensor development. In Proceedings of Oceans 2011 conference (USA, September 2011). (4) Deployment photo courtesy of Dr. Peter Linke, GEOMAR http://www.geomar.de/index.php?id=plinke.